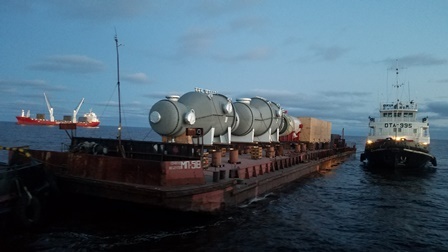 Between June and October 2018, Volgo-Baltic Logistic (VBL), a subsidiary of North-Western Shipping Company (NWSC, part of UCL Holding), performed a unique transportation of oversize equipment intended for modernization of Gazpromneft’s Omsk Refinery. The operation is a part of a long-term project launched in 2016, NWSC says in a press release. North-Western Shipping Company PJSC, is the largest carrier in the Russian system of waterways, specializing in export/import shipping of bulk, general and project cargoes, towage of oversized cargo and crafts. The company operates a fleet of 47 river/sea class vessels, 10 sea class vessels and 3 Ro-Ro barges of river/sea class. Total deadweight of the Company's fleet is 288,000 tonnes. About 60% of the fleet was built between 2002 and 2013. Average age of the company’s fleet is 17.5 y.o. The company transports about 5 million tonnes of cargo per year. Throughout the decades, the shipping company has accumulated an extensive experience in transportation of oversize/overweight equipment for manufactures of Russia and neighboring countries. NWSC subsidiary, VBL, is the leader in this transportation market being one of few companies able to perform unique deliveries by the Northern Sea Route to the ports of Western Siberia. NWSC is part of VBTH, a shipping division of the international transport group UCL Holding that consolidates several Russian shipping, railway, stevedore and logistics companies. The division also comprises Volga Shipping Company, V.F.Tanker and a number of shipbuilding assets.